What's the connection between coffee and the birds that breed in our backyards? The Songbird	Foundation tells us that the single greatest threat to the songbird's survival is the growth in sun-grown coffee production, which is now the most popular method of growing coffee in Latin America. Coffee comes from the roasted and ground-up beans of coffee plants. Traditionally, coffee has been grown under a canopy of shade trees. Such "shade" coffee plantations, which are often on small family farms, provide a rich habitat for migratory birds. These small farms also cultivate diverse crops under the forest canopy. Growing fruit, avocados, cacao for chocolate, and trees for firewood provides a diversified living for small family farmers. The tree canopy in shade coffee plantations protects the soil from erosion and provides natural mulch for coffee plants, reducing the need for chemical fertilizers and herbicides. The diverse natural environment provides the right nutrients and natural pest controls. No wonder shade-grown coffee farms also provide habitat for over 150 species of North American Songbirds. Many other species of native birds, animals, and plants thrive there, too. 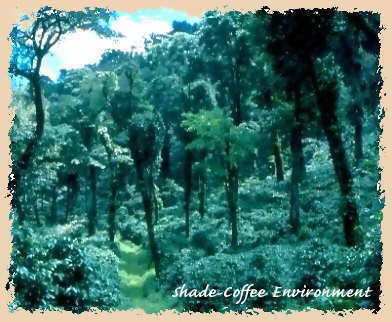 Now shade coffee plantations are a threatened habitat. Until the 1970s, nearly all commercial coffee production was managed under a canopy of shade trees. Encouraged by funds from U.S. aid and local governments, farmers began growing types of coffee plants that thrive in the sun. Then a big rise in the price of coffee made farmers want to raise even more coffee. Since more sun bushes can be cultivated per acre, and each plant produces as much as three times more coffee than a shade bush, the switch from shade to sun coffee seemed sensible. Debt-strapped nations "modernized" coffee growing in hopes of boosting	exports. "Sun coffee" varieties started replacing traditional shade coffee plantations. The "shade" versus "sun" controversy began. Sun or Shade: What's the Difference? Coffee lovers say shade coffee tastes better because of how it grows. A traditional shade coffee farm resembles a forest, with several layers of trees. These include fruit and hardwood trees, epiphytes (plants that grow on top of trees, such as many orchids), and other plants that often have value. Some are food; others may have health benefits or medicinal value. 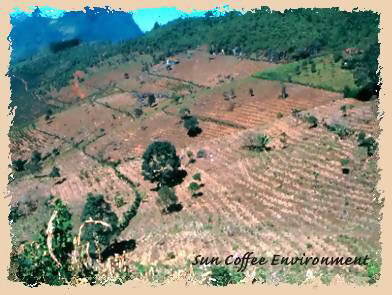 Coffee farmers have converted from shade to "sun" grown coffee, cutting down trees to grow coffee in sunny, open fields. Most often, sun-grown coffee comes from large industrial plantations. Walking in a sun-coffee field is similar to walking in an apple orchard, where one species of plant dominates the landscape. There is no tree cover at all. Coffee bushes grow directly under the sun. Sun-grown coffee is bad news for orioles as well as all migrants and other species that prefer or need forest habitats. It's bad news for the environment, too. Although the sun coffee produces more coffee per acre, it requires lots of chemical fertilizers and pesticides. These chemicals create serious water and other pollution problems. They expose the workers to serious health risks. Sun coffee requires the use of machinery and an intensive workforce	year round. The destruction of forests throughout the tropics has been devastating to migratory bird populations as well as resident species. In the mid-elevations of Mexico, Central America, the Caribbean, and Colombia, most of the forests still standing are in traditional coffee plantations. These provide the last refuge for birds that have lost their	habitat to the vast destruction of tropical forests. Once people hear about shade coffee, many want to buy it. Do coffee drinkers in your family know about shade coffee? Is shade coffee available in your community? 1. Use your Buying Power to Protect Birds. 2. Conduct a Shade-Grown Coffee Campaign in your community. The Songbird Foundation reminds you that your efforts on behalf of shade coffee can help save the valuable rainforest, refuge for nearly 150 species of songbirds. It creates healthier workplaces for growers and their families. It promotes organic farming methods and reduces the need for pesticides and herbicides. It supports other valuable crops along with coffee. It preserves the ecology of our planet for future generations and nurtures migratory bird survival for the enjoyment of all!